A human fibroblast—part of the body’s connective tissue—sits on a bed of vertical nanowires in this image from a scanning electron microscope. Hongkun Park and his colleagues hope that the nanowires, which penetrate the cell without harming it, can be a way to introduce genes into cells without the use of an engineered virus or invasive delivery method. One application could be adding a set of genes to fibroblasts that “reprogram” them to act like stem cells. Nine Harvard affiliates received "high-risk research" support in 2008 from the National Institutes of Health. Modern neuroscience rests on the assumption that our thoughts, feelings, perceptions, and behaviors emerge from electrical and chemical communication between brain cells: that whenever we recognize a face, read the newspaper, throw a ball, engage in a conversation, or recall a moment in childhood, a pattern of activity in our neurons makes such feats possible. It's a tenet of modern biology that sparks fascination--and disbelief. How can a tangle of cells produce the complexity and subtlety of a mind? Answering that question has always been propelled--and limited--by the available technologies. Accessing the living brain is difficult, and yet studying neurons outside their normal context can't tell us how they work together normally. Today, using anatomical studies and technologies like functional magnetic resonance imaging, scientists can finally observe large-scale patterns of how the brain is organized. In animals, they have begun to map out networks of neurons responsible for processes like vision and smell. And detailed studies of individual neurons have revealed much about how they "fire" electrically in response to inputs from other neurons, or release neurotransmitters to communicate with one another. But one of the most difficult questions in neuroscience is how to connect these two scales: how do individual neurons link to one another in networks that somehow result in complex brain functions? Three scientists at Harvard received Director's Pioneer Awards from the National Institutes of Health (NIH) in 2008 (see sidebar) to pursue innovative new approaches and tools for studying neurons and their connections in the brain. Charles Lieber and Hongkun Park, two experts in nanotechnology, will be developing small-scale devices for studying and communicating with neurons in novel ways. Aravinthan Samuel, a physicist looking for overarching principles of behavior, will be developing a new imaging system for linking the actions of neurons with an animal's behavior. That all three are addressing problems in neuroscience from backgrounds in chemistry and physics rather than biology underscores the truly interdisciplinary approaches and new tools necessary to access and study the brain. That they are supported by the government's premier biomedical research entity suggests just how important the input of these fields is to neuroscience. Neuroscientists view neurons as the fundamental unit of the brain, meaning that all the feats a brain accomplishes can be explained by activity in these interconnected cells. Neurons communicate across tiny gaps between cells, called synapses--yet current techniques for interacting with these cells operate on a larger scale and can interfere with their normal functioning. Hyman professor of chemistry Charles Lieber believes that smaller-scale technologies that operate on the scale of cells' own communication can provide a better way for scientists to understand and interact with them. "We're trying to build artificial synapses," he explains. Lieber is a leader in the field of nanoscience, the study and development of structures on the scale of atoms and molecules (see "Thinking Small," January-February 2005, page 50). Though the work of his lab ranges widely, his Pioneer Award-winning project will bring his group's technologies to bear on problems in neuroscience. Nanotechnology has often been applied to problems in manufacturing and electronics, but it is proving increasingly useful for biology. Work by Lieber and others has shown that semiconductor nanowires--incredibly thin structures that have a diameter on the order of nanometers (a billionth of a meter; this page is roughly 100,000 nanometers thick)--have potential applications in biology and medicine as sensors. Several years ago, Lieber's team showed that these structures are electrically sensitive enough to pick up a voltage as small as the slight change in electrical charge that occurs when one molecule binds to another. In other words, Lieber says, his team found that "we could not only detect electrical signals, we could actually transduce chemical and biological signals," turning a molecular event into a measurable electrical change in the nanowire. The group demonstrated that nanowires can detect the presence of a protein at a concentration many times smaller than had been possible with previous technologies. This work led Lieber to the larger goal of using nanoscale technologies to develop new methods for communicating with cells. Brain cells, which employ both electrical and chemical signals, were a particularly promising area of focus. The goal, he says, is to "build an interface to effectively determine what's going on in neurons or arrays of interconnected neurons." This would allow scientists to send and receive signals to and from individual neurons in a way that better mimics the cells' own communication habits. By marrying living neurons with fabricated nanowires, researchers in the Lieber laboratory have created neural networks with synthetic inputs and outputs. Neurons communicate via axons and dendrites that project from the cell body, and Lieber’s team can control where these projections, known as neurites, go. 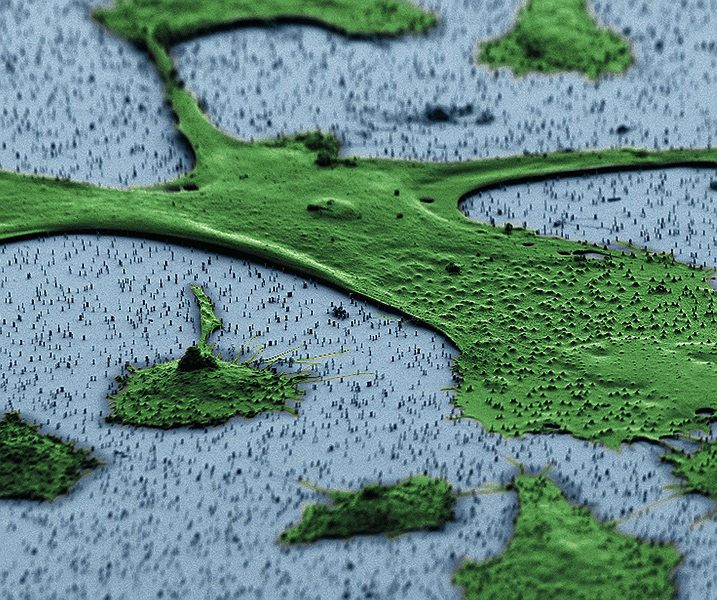 The neurites are connected to nanowires (too small to be seen in this optical image) that bridge electrode pairs; each nanowire can be independently addressed, either passively recording activity or delivering a stimulus to test for a response. In 2006, Lieber's group published a paper in the journal Science demonstrating that an array of nanowire transistors could be used to detect, stimulate, or dampen electrical signals from neurons. "We're able to do electrical measurements in a way that people haven't done before," he says. (This work was a small part of the basis for the Pioneer Award that is now enabling him to explore these concepts considerably further.) His team has also found that the nanowires can detect a chemical signal from neurons--in this case, the release of dopamine--in addition to electrical signals. A next big step, Lieber says, is to develop an interface for an entire network of neurons. Initially, his team has worked with isolated neurons grown in culture. Although such cells provide a more controlled subject with which to create a device, Lieber acknowledges that to have an impact on understanding the brain, the devices must eventually be able to interact with groups of interconnected neurons. "Biology doesn't care about one neuron," he says, "but you have to crawl before you walk." One direction now being pursued in collaboration with professor of molecular and cell biology Venkatesh Murthy is to use arrays of nanowire devices to interrogate the neurons in fresh slices of brain tissue. Murthy says the current work, which is exploring the region of the brain responsible for processing smells, is laying the initial groundwork for using nanowires to study neurons in brain tissue, and so far, "We're seeing that these probes can in fact measure meaningful electrical signals." Right now, the scientists are focusing on measuring the patterns of neuronal activity in a network of neurons taken from brain tissue. Murthy believes the devices could also be useful for measuring activity at multiple sites within a single neuron, which is very hard to do with existing techniques. A single neuron may receive thousands of inputs from other neurons at its synapses, which Murthy compares to lights flickering on a Christmas tree. Scientists can measure an average of the activity at all the synapses, or occasionally isolate one or two. The ability to measure activity across many different sites within a single cell could reveal each "light" individually as it switches on. Lieber's team is also focusing on ways to present nanowires in arrays that will facilitate interaction with the cells in tissue and organs. These arrays can be assembled on glass slides for use under microscopes, or coated onto a thin slip of plastic film. The latter approach has been used to create flexible films that were affixed to a beating heart to record electrical pulses. He imagines the same kind of approach could be used to take measurements directly from an animal's brain. Depending on the arrangements of the nanowires, such a device could take multiple readings of a single cell and/or record responses of distant cells. Currently, Murthy and other neuroscientists have been using optical microscopes to visualize the chemical activity of cells in the living brain (see "Shedding Light on Life," May-June 2008, page 40). But imaging techniques are limited in spatial resolution, and high-resolution methods come at the expense of speed and the ability to watch cells activate in real time, something nanoscale sensors may be able to provide. Nanoscale structures offer the opportunity to interface with cells on their own scale. In that sense, they have the potential to become "a totally new interface for living matter," Lieber says. His vision for nanoscale devices is not just to study cells but to use them to communicate with and control them. That in turn could lead to more precise neural prostheses to treat blindness or neurological diseases. "My overarching interest," he says, "is to ask whether one can blur the distinction between an electronic nonliving device and a living device, which is the cell." Neurons are linked in intricate networks; as already noted, one cell may receive thousands of inputs from other cells. Scientists often refer to the "circuitry" of the brain, and use the metaphor of a computer to describe how it works. Without understanding the structure and behavior of these circuits, it's difficult to make the connection between the activities of single cells and the higher functions of the brain. Hongkun Park points out that to understand the workings of a circuit board in a computer or other device, engineers use a technique called "system identification." Armed with a voltmeter, they give each circuit some input and measure the outputs until they can map all the connections in the system. Park would like to take the same approach with brain circuitry. "If you could do a system identification of a neural network, and talk to each and every neuron," he says, "you should be able to figure out a lot about how they function." When Park became professor of chemistry and chemical biology and of physics at Harvard, he was an expert in the properties of nanoscale structures and materials. But he wanted to take his work in a new direction: to tackle the workings of the brain. Rather than simply dipping into neuroscience, Park decided to plunge in. The Pioneer Award has helped him revamp his lab to do biology, raising laboratory animals and investing in microscopes. The problem that Park wanted to address is the question of how the networked connections between neurons result in brain function. Teasing out the precise workings of a circuit requires highly specific probes. Like Lieber, Park has focused on semiconducting nanowires made of silicon as a tool to "talk" to neurons with more precision than current techniques allow. Park's team has developed a tool called a vertical nanowire array: essentially a bed of nanoscale needles. Surprisingly, when cells are placed on top of this prickly surface, they "seem to be perfectly happy and do what they want to do," he says, including growing and dividing as normal cells would, despite the fact that the nanowires impale their membranes. As a first step, Park's arrays could be used to measure activity in groups of cultured neurons as a model system for the kinds of networks that form in the brain. Eventually, however, Park hopes to develop three-dimensional arrays with wires of various lengths capable of interacting with more complex systems: a slice of brain tissue, or the brain of a living animal. Park believes that this type of array could help neuroscientists answer questions about communication in the brain that now can be discussed only in theory. For instance, scientists often study how connections between neurons strengthen or weaken in response to activity, a phenomenon that is thought to underlie learning and memory. But studies of these changes are usually done with just a few neurons. Park points out that there's no reason to think that learning involves only neurons in direct contact with one another; instead, it could involve some global change across a large network of neurons. The development of new tools, he says, "not only helps answer existing questions, but it allows you to ask an entirely new class of questions." Studying how the environment shapes behavior in a human, or even in most animals, is dauntingly complex. But when scientists look at much simpler organisms, the task become manageable. For instance, scientists have been able to fully understand the strategies and mechanisms that the single-celled bacterium E. coli uses to navigate its environment when faced with differences in temperature or nutrients. As a postdoctoral fellow and now an associate professor of physics and member of the Center for Brain Science, Aravinthan Samuel has focused on a project to describe the motile behavior of another relatively simple organism, the tiny roundworm Caenorhabditis elegans. Samuel is trying to understand behavior, but not from the perspective of psychology. Instead, he wants to understand and describe behavior in its most basic form: how does an organism process the inputs in its environment and respond to them accordingly? And what are the actions of neurons in these responses? If understanding how individual neurons connect and interact in the brain is a primary goal of neuroscience, the next question is how that activity gives rise to thoughts, emotions, behaviors, and responses to the environment. A fruit-fly larva navigates its environment as it searches for food. Its simple movements as it responds to stimuli can be recorded, analyzed, and quantified, providing an opportunity to describe the precise relationship between activity in neurons and specific behavior. By now he is an expert in worm behavior. He points to a machine in his lab that holds a plate with a grid of water droplets; in each drop swims a tiny worm. The worms can be seen on a monitor; confined within the droplets, they swim in place as if walking on a treadmill. They move in an almost rhythmic fashion, but Samuel points to one worm that curls suddenly. It's unhappy, he explains. The temperature is being raised and lowered in a controlled pattern, and when the worms experience a temperature they dislike, they try to move away from it--but trapped in the water droplet, they can only recoil and begin to swim again. Although the movements of unhappy worms may seem primitive, they can be recorded visually, analyzed, and quantified in a way that more complex behavior can't. Because C. elegans is transparent under a microscope, it provides a window into how behavior is produced at the level of single neurons. By introducing into the worm a fluorescent molecule that lights up when neurons activate, Samuel and his colleagues have been able to follow the responses of a single neuron as the worm moves through its environment. Using such a simple subject, Samuel could literally begin to see the link between the internal and external world of an organism. But he also felt he needed to move to a more complex subject, because the very simple nervous system in C. elegans has fundamental differences from the brains of larger animals. For his work to have a broader impact on neuroscience and be more relevant to the human brain and behavior, he needed to find a different organism. As part of his Pioneer Award work, Samuel has been directing part of his lab's effort toward the larvae of fruit flies. These tiny creatures may not seem much of a leap forward, but fruit flies have organized brains with 10 times as many neurons as C. elegans, and they have already proven useful as model subjects for neuroscience research. For Samuel, the larvae are ideal subjects because their behavior is much more limited than at the adult stage, and therefore easier to capture and evaluate. Normally, fruit flies lay their eggs in fruit; after hatching, the larvae feed on microbes that live on the fruit. The job of these juvenile flies is to crawl around, eat, and grow. In other words, despite their more complex brains, they behave much more like worms than flies. And because they are also transparent, they can be engineered so that their neurons fluoresce when activated, thus enabling visual signaling of nervous-system activity that can be seen under a microscope. Samuel's biggest challenge now is to find a way to link the overall movements of an organism with what's going on inside. Most imaging technologies are designed to work within a limited spatial scale. A large part of his work over the next few years will be designing a microscope that can bring together both scales--tracking the movements of larvae while also visualizing the activity of neurons in their brains. This focus on creating new equipment distinguishes Samuel's lab from those of many other biologists. "Tool-building is central to how my lab works," he says. "Every time we ask a question we have to build a microscope." Although the hybrid microscope he envisions will be tailored to his own purposes, he hopes it will aid other studies that involve visualizing activity in different scales. But he also believes that the conceptual part of his work is just as important as technical achievements--that rigorously describing and quantifying behavior are essential to understanding it. "If we have a characterization of behavior that's crisp," he says, "we can find genes that affect behavior, or develop high-throughput assays that could discover molecules that affect higher-order brain functions." The nih pioneer awards require that investigators direct more than half of their time and resources toward their funded projects for the term of the award, yet results may not emerge for years. Even if new tools that Lieber, Park, and Samuel are developing prove successful, it's a long way from analyzing a single network of neurons, or tracking a simple behavioral response, to understanding larger questions about how the brain functions. The human brain, which holds a hundred billion neurons connected by hundreds of trillions of synapses, poses an almost unimaginable complexity for scientists. Park says that scientists have many good ideas for how memory, learning, and other brain processes happen, "but we cannot experimentally test them in any rigorous fashion because we lack the tools." Addressing the great questions of neuroscience will require a multitude of tools and approaches, and no one technology will provide all the answers. But each approach may contribute to filling in a gap in current knowledge: linking the firing of a neuron to the patterns of a neural circuit or the movement of a living animal. It is only through connecting the dots between these processes that neuroscientists can begin to explain how individual neurons link together to become a working mind.